Our enjoyment of Cyrus Shahrad's hypnotic production work under the guise of Hiatus has been steadily increasing, and his latest efforts, combining with Matt Falloon of Smoke Feathers proves no different. Their collaborative EP, 'Change Up', is released today and available to listen below. Shahrad and Falloon met at Cambridge University, forming a band with Hot Chip's Alexis Taylor no less. Their musical paths diverged (quite dramatically) following their studies but now they have reunited. And it is a most fruitful effort. Shahrad is, of course, no stranger to this spirit of collaboration, successfully working with Shura. (The duo are still playing the odd live date together, as it happens.) We enjoyed their tracks so much that we even raved about them when we were invited to chat to BBC 6Music on their Now Playing show. This latest combination sees Falloon's solemn vocals and Shahrad's malleable production come together particularly luminously on the EP's beautiful title track. 'Change Up' treads serenely through a soft, soulful landscape. 'Book Of Prayer' and 'Flickering' take a slightly different tack, with a more striking undercurrent, but the tracks all come together to form a formidable EP. 'Change Up' is released today. 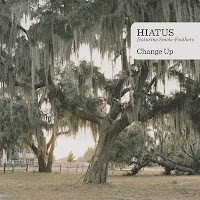 Find more info at facebook.com/hiatusmusic. Purchase from amazon.co.uk.